I’ve flown dozens of motors over the years, searching for a motor that closely matches the mission of New England pilots. We have lots of trees, short fields, and hilly terrain. Sometimes we have to climb a hill or cross a stream to access our launch area. 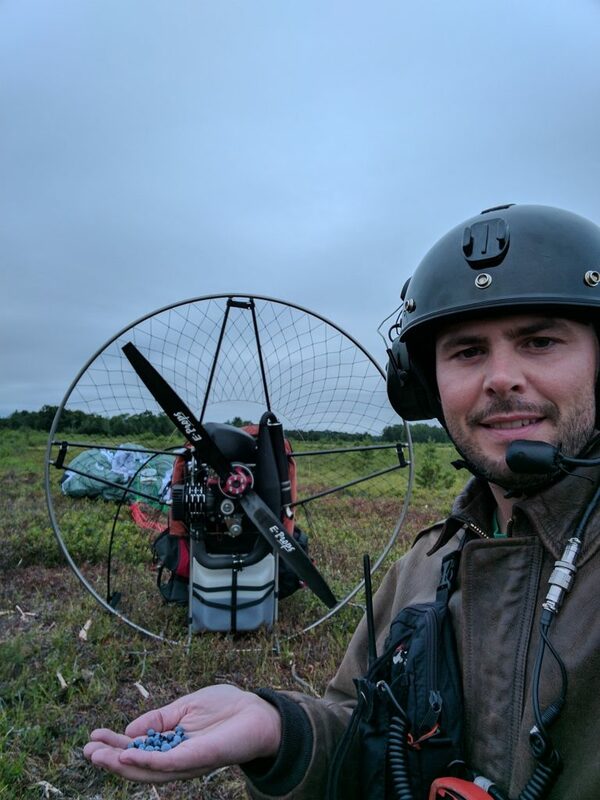 There aren’t many motors I’d feel comfortable with landing in an unimproved blueberry field in the middle of nowhere, let alone relaunching (after refueling the pilot). I was searching for a motor light enough to hike short distances, durable enough to take a fall, and powerful enough to rise above the treeline quickly. It also had to be reliable, and start in the freezing cold, too. Two Air Conception Nitro 200s. The one on the back of the car is an Electric Start model with an auto-inflating flotation collar and a strobe light. The Nitro 200 on the ground is a Pull Start, and weighs 42 pounds in this photo. In 2016 I tested an Air Conception motor. The next season, I bought a couple titanium-framed Nitro 200 motors for the school. 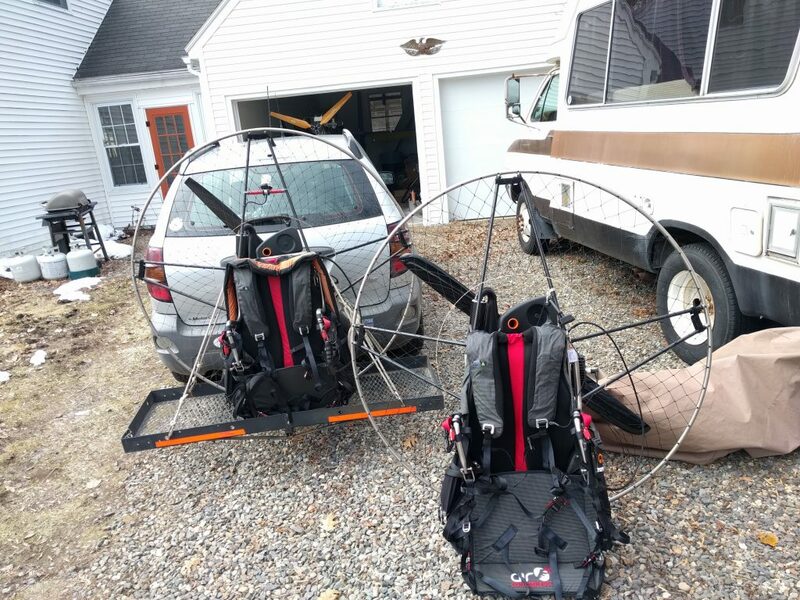 I tripled the number of per-session flights my students were getting that year– the motor was light enough that even students with pre-existing back pain were able to launch and land all afternoon. The reliable electric start expanded the sport to pilots with shoulder injuries (and the LiPo-powered electric starter works well below freezing). What’s more, the power in the machines was moderate enough for the 130-lb students, but sufficient for the 230-pounders as well. We had a couple of fall-downs over the years, but never anything broken. Everything my students and I threw at the Nitro 200s, the motors handled with aplomb! There are other fine motors in the lightweight-power category; In fact, the whole industry is converging on this paradigm. Accounting for budget, pilot weight, motor availability and taste, everyone has their reasons for choosing a particular motor, and they’re not wrong. There are many factors that go into choosing a motor. After trying out 30 different motors, I chose Air Conception. In order to be economically viable as a school, and to provide undivided support for what I sell, I decided to focus on one motor that would best serve my New England customers. There isn’t just one feature that elevated this motor above the others; It has the right mix: the right weight, the right power, the right amount of complexity, and even the right compromises. Sure, there have been things I would have changed on the motor, but you know what? Every year the new motors come to me with some changes implemented. Air Conception listening, and they are continuously improving their machines. In conclusion, Air Conception’s mission is aligned with the needs of our New England pilots, and the manufacturer is building the lightweight, powerful, reliable motor of our dreams! 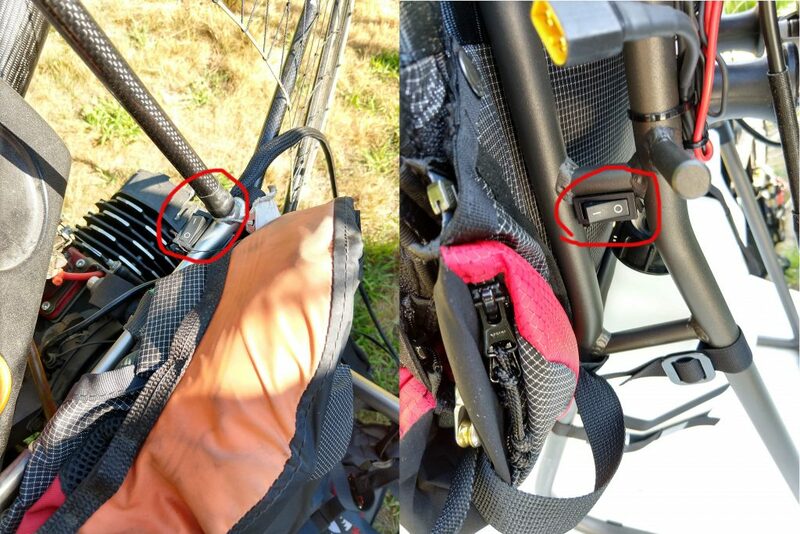 On the Left, the 2017 location of the electric start Master Switch. It was up high, behind the pilot’s shoulder. On the Right, the new location of the Master Switch, down low and easy to reach near the pilot’s waist. This and other small improvements to the product with each iteration give me great confidence in the manufacturer.